Bluetooth may be a connectivity feature you are more used to on your smartphone for sharing files, streaming music and calls to speakers and headphones and more. The whole concept of it on a toothbrush may seem a bit ridiculous to some. But, the ridiculous is here and its all geared toward improving your oral health. 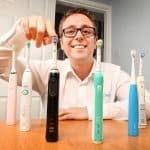 Oral-B were the first brand to put Bluetooth into a toothbrush, but Philips Sonicare, Colgate and others have followed. It’s not a feature that we class as ‘high importance’ in our guide to buying a new toothbrush post, but do not be put off by what you may consider a gimmick. It does actually work and for some will add real value. In this post, we therefore explain Oral-B Bluetooth Connectivity; what it is, how it works, and how you can make use of it. Bluetooth connectivity is a wireless standard for short-range interconnection between electronic devices. 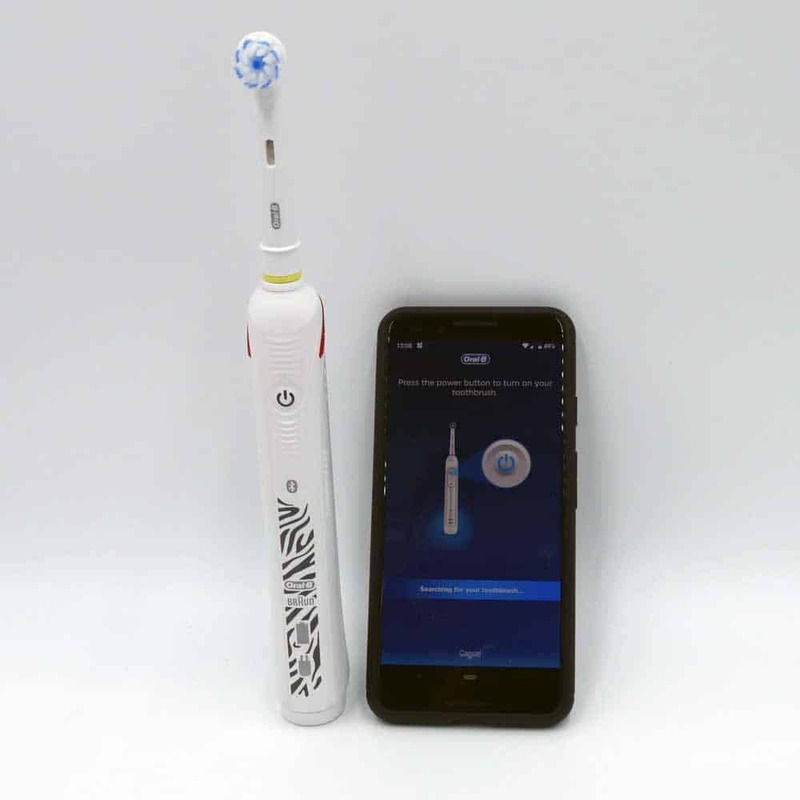 It is this technology in your toothbrush, smartphone or tablet that allow the brush and your mobile product to communicate and capture relevant data. This is not an explanation of exactly how Bluetooth works, but how it works in relation to the toothbrush. You need a mobile device such as a smartphone or tablet that has Bluetooth and can run the Oral-B app. On your Apple or Android device download the Oral-B app from the app store. You can get the Android app HERE. Once you have the app downloaded, you need to turn on Bluetooth from the settings on your mobile device. Once Bluetooth is enabled on your smartphone, open the app and follow the on-screen direction for pairing the brush. The process takes just a few seconds normally and is completed most often by turning the brush on or pressing the cleaning mode button. All being well your phone and app will communicate successfully and once complete, there will be no need to re-pair in the future, unless you actively delete the pairing. With the connection established, the two devices can communicate and share the key data between them. 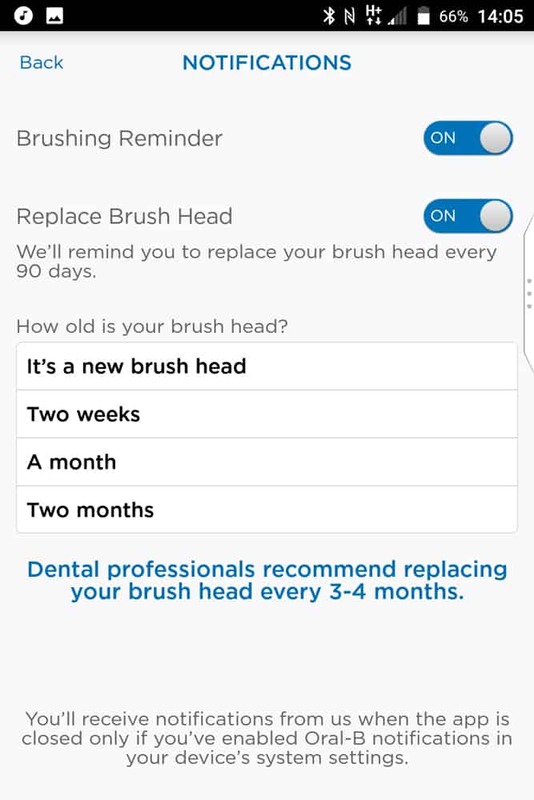 The brush can send data to an app, such as how long it has been brushing for and if too much pressure has been applied when brushing. What might be mundane information is then presented in a nice and engaging format on the app screens. The app can in turn send data back to the brush handle. The number of options has improved over time, but you can do anything from customising the cleaning time, to enabling and disabling specific modes and more. 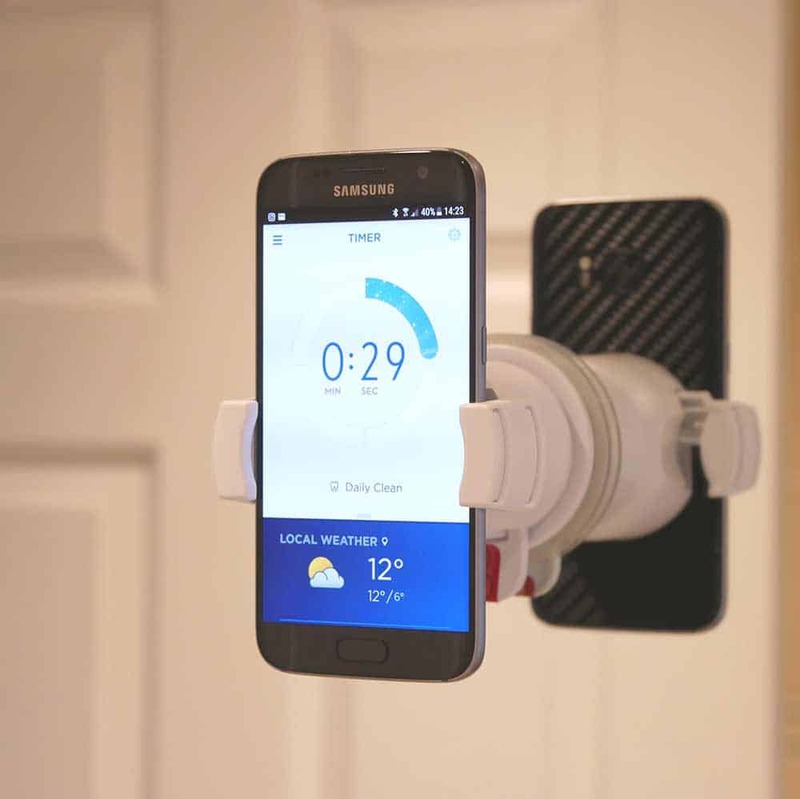 The sharing of data between toothbrush and smartphone is intended to assist you and I as the users in creating better brushing technique and habits. 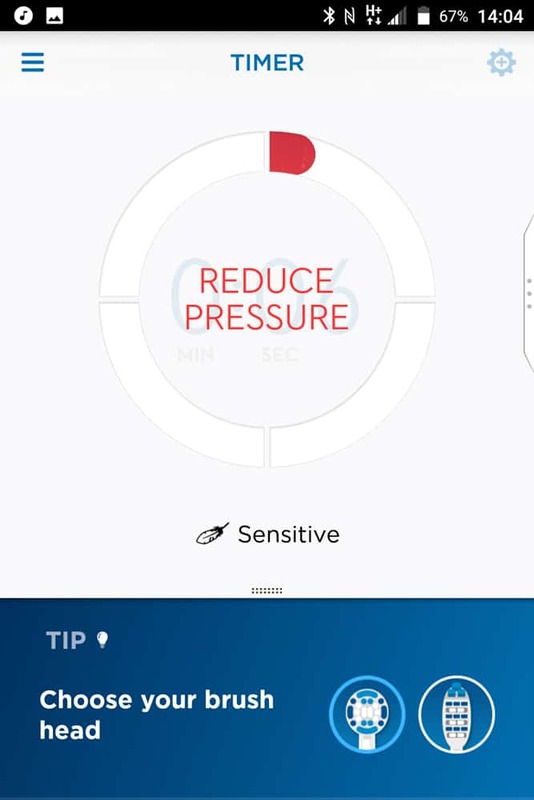 The Oral-B brush handles can hold up to 20 cleans worth of data so you need not constantly have the smartphone and brush connected each time you brush, although it can be useful if the app is in front of you each time. Not everyone wants their phone in the bathroom though, so just make sure fairly regular connections are made and the brushing data will be transferred to the phone for review. Therefore, it is perfectly possible to go 4 or 5 days without pairing to the app. The next time a connection is made, the data will be synced back to the brush, so you have this cleaning data in your records. 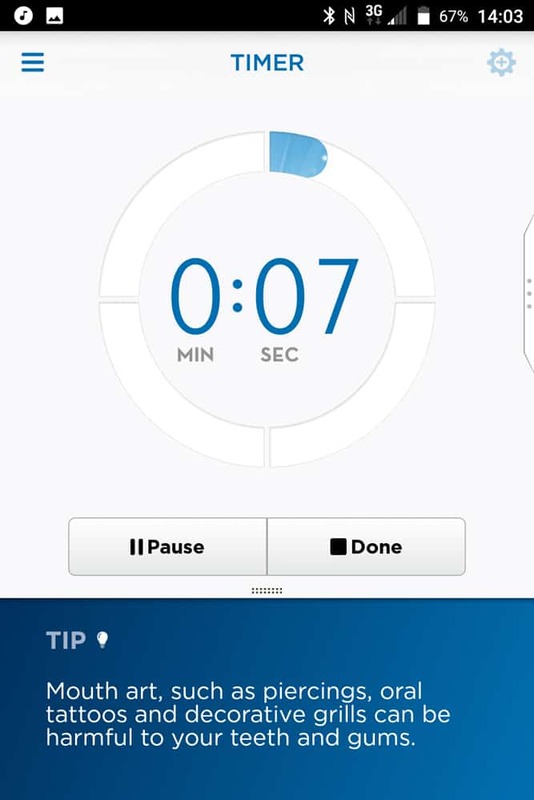 If you use the app at the same time as the brush, you will see a timer on screen showing how long you have been brushing for and how well you are doing. It will show if too much pressure is applied and what cleaning mode you are using. 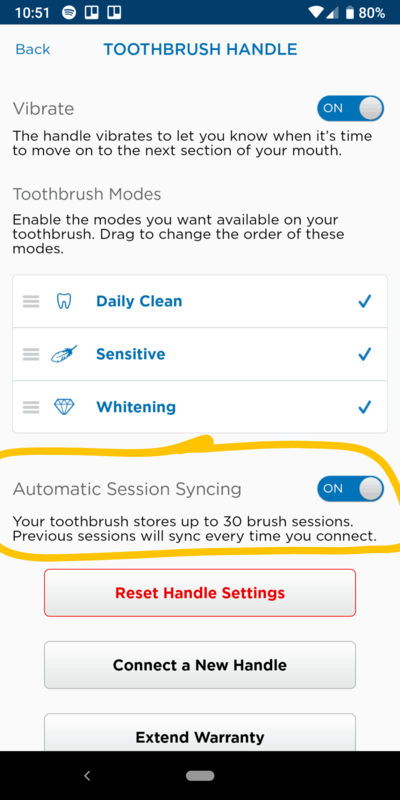 The whole purpose is to log your activity and help make improvements in your brushing technique to improve your oral health. The app can intelligently make suggestions and provide tips to to further improve your oral healthcare routine. Brushes like the Genius 9000 even have position detection technology that uses the front facing camera of the smartphone to track the toothbrushes position in the mouth and further learn and improve your approach. Oral-B are continually updating and improving the app for our benefit. There are countless features we could explain, but here is a list of the main options available within the app and what they offer you. Create an account and your data can be backed up/stored on Oral-B’s system which should make it easy to retain data if you change toothbrush or smartphone. 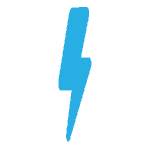 You can get personalised data sent through to you for review and encouragement as well as more generalised news and info if you wish. This is the live countdown of your brushing routine. It shows how long you have been brushing for, what quadrant you should be focused on, what cleaning mode you are using and if too much pressure has been applied during the brushing cycle. This gives the option to customise the app and the toothbrush to aid you in achieving specific oral healthcare goals, be that freshening breath, fighting plaque or improving the health of your gums. Specific conditions are set, some of which are dependant upon the model of your toothbrush. As the name suggests, it adds a more fun element to the brushing, using the front facing camera to show you on screen with an overlay of a theme. Rewards are offered when certain points are achieved, there are sound effects and Gif recording. You do get the on screen timer and logging of the clean too. The log of your cleans by day, week, month etc. See how many brushing sessions you have achieved, what you average brushing time is as well as how long you have applied too much pressure and even when you have flossed (if you logged that data). You can even export the data as a PDF for the last 3, 6 or 12 months. Unlock trophies for hitting streaks. Brush every day for 2 weeks, that trophy will be unlocked as will the 30 day flossing streak once you achieve this. Built in to act as motivation. A glorified interface that links you to the websites of Oral-B approved retailers, who sell their products. Find the brush heads or toothpaste you want and be redirected to that retailers website to make a purchase. A number of features here, but it allows options such as having your dentist programme particular care routines, reminders for things like flossing, brushing as well as product recommendations. You can also log upcoming dental appointments here for your records. Control all the settings of the app, from how the on screen timer looks through to disabling cleaning modes on a brush handle or even deleting a pairing between the handle and the app. Apply for an extended warranty, control what content is shown in the app and what notifications you get, including when you are reminded to replace your brush head. Which brushes have Bluetooth connectivity? There is an app for Android and iOS devices. The compatibility of the app with different products may vary. There are a number of frequently asked questions surrounding the Bluetooth connectivity and the Oral-B app, the answers to which are included below. If you have any other questions, please leave a comment below or get in touch. Can the brush connect to 2 or more different mobile devices and sync the brushing data for different users? Is it right that the app requires access to my device location? Yes. This is a permission that must be granted for the app to work. Disabling or denying this permission will stop the app from working correctly. The brush is not connecting to the app. What do I do? The cause may be different for each user, but it is worth turning both the mobile device and the brush off and restarting them. Make sure that Bluetooth is turned on and your mobile device is marked as ‘discoverable’ within the settings. For previously paired devices, try deleting the connection and re-pairing. I have the pro 6000 and I want to turn off the Bluetooth on my brush. I tried the steps by holding the on and the mode button and it seems like the Bluetooth is off and I put the brush to be charged. As soon as I pickup the brush again it lights up the Bluetooth button again, which tells me the Bluetooth is on again. How do I make sure the Bluetooth doesn’t turn on again? These steps to turn off Bluetooth on the toothbrush, where are you getting these from? I don’t recall off the top of my head a way to actually turn the Bluetooth off on the brush handle. You can use the brush without making use of the Bluetooth connection, does the Bluetooth connection need to be turned off? Hi, My app has been stuck on day 56 (this is your final sesion) for over a week now and its bugging the life from me. I cant unlock acheivments and although the main stuffs working like gum guard etc it constantly day by day says the same thing over and over. I love my 9000 genius but the app fails me which is a shame because its my daily ritual. 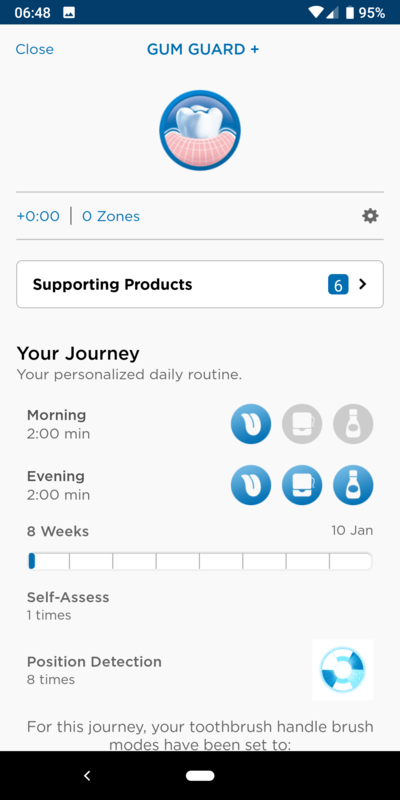 Did you setup a ‘Dental Care Journey’ within the app where you have been working to achieve a specific goal? It might well be a case that you have and this needs disabling. Black 7000 is not charging. Does it have to have blueTooTh set up for it to be used, charging etc? Can I not set up Bluetooth for it to charge? Hi Darlene. You do not have to set Bluetooth up for the brush to charge. The brush can be used day in and day out without ever using Bluetooth,if you wish. It can take 12 hours or so to fully charge a brush. Presumably the socket is working? Any lights on the brush when sat on the charging stand? Since connecting my toothbrush to the app the wireless brushing timer on the sink no longer works… is there a way to get the clock to work again? Geoff, this is a little odd. What model do you have? You might want to try pairing the handle again by visiting this article and scrolling down to the section ‘It works with more than 1 brush handle’ and follow the steps outlined. Hopefully that will get you back up and running. Hi just received as a Christmas present, despite all settings on & as discoverable on my Sony experia with latest software it still won’t connect to Bluetooth, it will be sent back .Complete waste of money.wont recommend. What brush in particular did you receive? Is the phone seeing the brush or making any connection at all? Hi, I recently bought a genius 9000 toothbrush but am unable to connect the brush to the app on my LG G5. The app will say connecting for a long time and never connect or it will keep on telling me to turn the power on then off. Please advise me on what would be best as I bought it hoping to experience the features on the app. You are not the first to have a problem with the brush connecting to an LG G5, it seems to be a common problem. Just see the other comments on this page. One thing to check is as part of the Google Android Permission setup, did you allow the app to have access to your location? If not, try allowing this. I got the 9000 and a oneplus 2 android mobile. Same sort of issue here, in the Position Detection mode it simply stays stuck on that circle thing even after the brush is turned off, I never get to see the score, except once by some miracle the score showed up. It sometimes instead goes to next screen saying brush your tongue. Do you know which smart guide you tested with the oral b 9000? There are a couple of models and I’d like to buy the right one. We have had others say they have purchased this and it works with the 9000. If every individual use their own phones to connect to the brush, does the settings of the brush changes automatically for everyone’s preferences? No. The brush can connect to multiple phone but only one set of data. If you want each user to have their own brushing data each user must have their own brush handle. Well that doesn’t make a lot of sense. A family should be able to each track their brushing with the one handle. It is possible that the data is being gathered for marketing purposes, but this is commonplace with a lot of apps now. Technically speaking though there probably isn’t a reason for the app to know your phone’s location each time. Yes that’s often the way with app permissions. They are ‘required’ for the app to work, so removing them stops the app from working. In this case it seems like location could be an optional permission but the app is setting it as required. It’s actually an Android (6 and up) Bluetooth problem. For some reason Google made the API to require Location permissions for “Low Energy Bluetooth” to work. Ivan. Valuable feedback. So if people enable location permissions, all will be ok? If you enable location permissions the LE Bluetooth connection will work. At the same time this does permit the company to collect your location data while the app is running, but I can’t say are they using it or not or to what level. In my experience, most companies use that data to know the distribution of their product and possibly the time of day it is used. It is highly unlikely (and in many cases banable from Google Store) that they are pinpointing you as a an individual. You are just a statistic. eg “150 people in London used our product compared to 100 a month ago”. Super Ivan. This is great info, Thank You. I do suspect that is how they use the information, based on previous press releases I have seen. I JUST BOUGH THIS THING FOR 130 BUCKS AND IT WON’T CONNECT TO MY MOTO G 4TH GENERATION PHONE. WHEN WILL THIS BE FIXED??? Hi Danny. We cant comment on incompatibilities with particular phones. We do not make the app, we are a third party site who has written about it? Is the phone detecting the brush at all and just won’t connect? It is possible that there is an incompatibility. As you may have seen via the comments here, the LG G5 is a device many have struggled to get this brush to work with. To determine whether it is phone related, do you have another phone be that of a friend or family members you could try? If it works with another phone you know its the phone that is the problem rather than the brush? It does not connect to Huawei P9 Plus. Tried it with my partners iPhone 7 Plus and it worked just fine. Really frustrated to have paid good money for a phone and good money for a tootbrush that are not capable to talking to each other. Sorry to hear this Clayton. Sometime there are incompatibilities due to the way manufacturers setup their Bluetooth profiles. It may well be that future software updates resolve this. I have the Oral B Pro 5000. It won’t connect to my Samsung Galaxy J3 anymore. Sorry to hear this. Have you tried removing the connection on the phone and re-pairing the brush to it? Do you have other Bluetooth devices the phone is connecting to? Yes, I have uninstalled the app, reinstalled it and I still isn’t finding my phone. Yes, the phone is connected to other Bluetooth devices. Thanks for the information Levi. I presume your Bluetooth is set to ‘Discover mode’ on the phone so that the brush can find the phone? It could be the Bluetooth on the brush that is at fault. Perhaps try connecting to a different phone if you have one or maybe that of a friend or family member. Just purchase a new Oral B 6500 Pro from Boots and Bluetooth does not work at all. When the brush is switched on and the Bluetooth light is on it doesn’t show up as available to be paired on any device. Tried an Ipad Air and a Samsung Galaxy S7. Have yet to use the brush at all so could safely be returned but seems a nuisance. Anyone else had this problem? Thats odd and a little frustrating Mark. Not heard of this issue before. Have you tried putting the brush on the charger and then taking it off to see if that makes it work? Might sound odd, but that might do the trick. I got mine working on a Samsung Galaxy S7 eventually. Under Settings – Connections – Bluetooth Improve accuracy settings – enable Wi-Fi scanning and Bluetooth scanning. Works a treat now. The best way to connect your LG G5 to the Oral B toothbrush is as follows: Turn Bluetooth on, Open Oral B app Go to settings, then timer then scroll to the bottom & male sure the sound is on. Then that’s it works perfectly. Hi Mike, Thanks for the feedback. Always helpful. Glad you have it working. My only fear is if you have turned sound on, that is then the phone listening out for the motor of the brush which is referred to as sound connectivity rather than Bluetooth so it might not be as accurate, none the less its a connectivity option and glad it is working. The app does recognize my current activity but did not recognize my activity of this morning. What can be the issue? Bas. Try re-syncing the brush, it should save it. Turn the brush off, wait for all the lights to go out. Open the app and follow the on screen instructions. Best course of action is to press the mode utton rather than the power button and that usually forces a sync. I have just wasted all morning trying to get it to work to no avail, very very frustrating was this thoroughly tested before launching it? Sorry to hear you are having problems in getting the Genius 8000 connected to your phone. I am unable to say what tests Oral-B went through prior to production. I had no issue connecting to my smartphones, but that does not excuse the fact. It is clear some people have had issues. This is likley down to Bluetooth protocols on the phone and how they have been setup and configured. Updates to devices and the app may help in time resolve the issue. Having the same problem as above. Pairs with my google pixel but not with my son’s Motorola Droid turbo 2. Won’t load on his phone past the connecting the app. Very disappointed. I have the same problem with an Oral B Genius toothbrush. I will sync fine with my Google Pixel XL phone but it will NOT sync with my wife’s Moto Z Droid. I have tried the passwords mentioned above, restarted the phone. Uninstalled and reinstalled the app. Still won’t pair. Hi Patrick. You have 2 new phones and it would sound like the Moto Z may have an incompatibility. I am not sure whether the app needs updating or it is something to do with the Bluetooth profile on the Moto Z. It could be that the latest software on those phones has been configured differently and an update, I would imagine to the Oral-B app might resolve it. Perhaps you could raise with Oral-B to have them look at it as part of their future testing. Sorry it is not working. I cannot get the brush – Black 6500 – to connect to my phone – LG G5. I have tried both the phone and app to connect the brush. The phone finds the brush but asks for a passcode, which cannot be set on the toothbrush. Using the App it finds the brush immediately but will not connect. Please advise. Hi Richard, We have not heard of anyone having issues connecting before. Common Bluetooth passwords are 0000 or 1234 which is worth trying. Are you following these steps as described in the user manual? Before using the Oral-B™ app make sure Bluetooth is activated on your smart phone (for directions please refer to your smart phone’s user manual). Your toothbrush will appear in the list of devices as: «Oral-B toothbrush». Note: Oral-B™ app functionality is limited if Bluetooth is deactivated. • Start the Oral-B™ app. You can use the app and your SmartGuide (i) at the same time. • Once you start using your toothbrush by lifting it off the plugged-in charger (h) or pressing any button (c)/(d), it automatically connects to the Oral-B™ app. If no connection has been established, briefly press the mode button (d) on your toothbrush handle and wait for a connection. • Any further app instructions will be displayed on your smart phone. • Keep your smart phone in close proximity when using it with your toothbrush handle. Make sure the smart phone is safely positioned in a dry place. I’m having the same issue on my LG G5 except it wont load past connect on the app.